What's this pile of papers again? Oh, right; it's "Hot"! 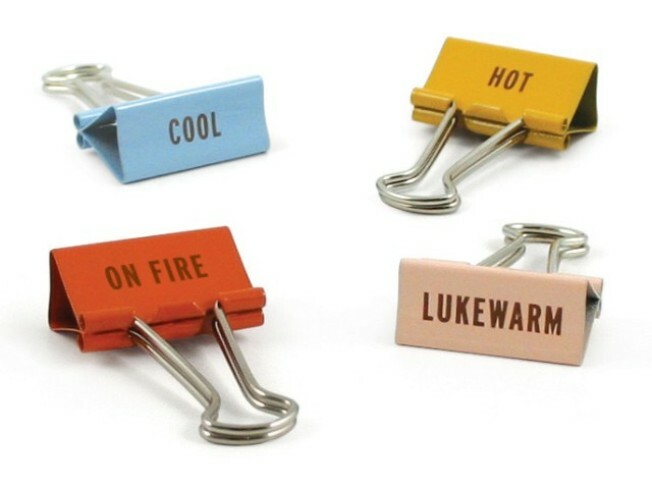 Find Temperature Task Clips at Knock Knock. WAREHOUSE SALES: The Barneys spectacular continues at its new location, the LA Convention Center; Plastic Island has dresses for $20 and under during its August 14th-15th extravaganza; the huginormous traveling Warehouse Sale lands at the Fairplex for August 15th-16th (20,000+ items are promised, with brand names all over the place). END OF SUMMER SIDEWALK SALE: Look for those trousers that really don't ride up, or the shirt to go with them, on August 15th and August 16th. That's when Waterside in Marina del Rey is throwing a mondo sidewalk sale. Looks like there will be a lot of summery things with discounted prices, which is good; after all, we live where summer peeks in, now and then, all year long.